What a beauty of a miniature Agave! It is among the most ornamental species, vying with A. victoria-reginae in the exquisite regularity of its form. Origin and Habitat: Agave parrasana is endemic to a very small area in south-eastern Coahuila (Northern Central Mexico), type from Sierra de Parras. Altitude range: Mountainous areas 1350-2400 m in elevation. Habitat: It grows on grassy slopes, in chaparral shrub and pine-oak forests on limestone. 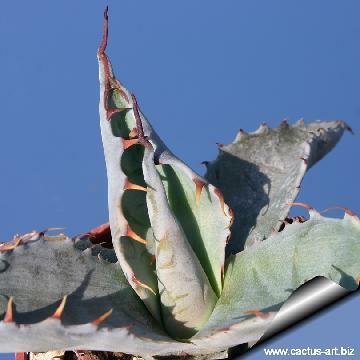 Description: Agave parrasana (Cabbage Head Agave) is a compact, chunky, small sized agave related and similar to Agave parryi. It has very short broad leaves that form into a tight, symmetrical, spherical rosette, shaped like a 'globe artichoke' up to about 60 cm tall by about the same diameter - young plants more upright but with age widen out. The surface of the leaves displays deep bud prints formed by the teeth of the leaves. It produces few or no offsets but can form small mounds in the pot or landscape. Due to the slow growth rate, these beauties take a while to develop into mature specimens with the classic artichoke form. When this species produces flowers they are red in bud and open to yellow with red highlights in panicles on a tall stalk to 4.5-6 metres. Like most Agave species, this plant is monocarpic, meaning that it will only bloom and bear fruit once during its life before dying. Derivation of specific name: the name 'parrasana' is a geographical epithet that refers to the location of the type species in the Sierra de Parras (Coahuila). Leaves: 40-60 per rosette, waxy dull grey-green with a dusting of silvery blue and closely overlapping. They are short, stout and broad, obovate, nearly round, measuring 20-30(-40) cm long and nearly 10-16(-20) cm wide, suddenly and shortly tapering above, acute to acuminate, usually concave above middle, thick and fleshy especially at base, very strong convex on the reverse, glabrous. They are edged with decorative but variable greenish-brown, straight to curved teeth. The teeth are largest near the leaf tip (17—20 mm. long), getting smaller towards the base, margin between the spines sinuate, the bases of the upper 4 — 8 spines confluent, spines at first yellowish-brown, then red, at last brown and then becoming grey. These teeth make striking imprints on the adjoining newer leaves' backside. The leaves end in a sharp thin red spine 2-2,5(-4) cm long and decurrent. The leaves are held tightly, almost like a bud, giving the plant a very distinctive form. Colour and tooth form are indeed quite variable. Flowers: In bud, the flowers are flushed with red or purple and open yellow, they appear on a 3- 4(-6) m tall ellipsoid panicle with 12-15 branches 50 to 60 mm long. The flowers are enclosed into large, reddish to purplish succulent bracts that subtend the clusters of flowers. The cylindrical flower tube is 10 to 15 mm long, , flowers have distinctly long reddish purple filaments and yellow anthers. .
Blooming season: Early to late summer (June-July till October). Remember that the plant will flower once, then it dies. 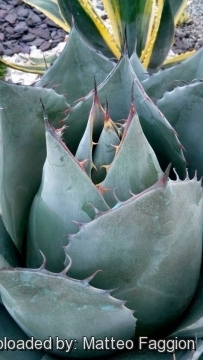 Notes: Agave parrasana is closely related and fairly similar-looking to Agave havardiana, Agave ovatifolia, and Agave parryi which form a complex of related taxon. The adult plants of these species are generally readily separated; it is the immature plants that are hard to separate from each other. These plants can be set apart primarily by close examination of the leaf margin, the teeth along the margin and the terminal spine. 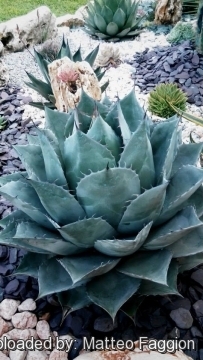 3) San Marcos Growers contributors “Agave parrasana - Cabbage Head Agave ” San Marcos Growers <http://www.smgrowers.com/products/plants/plantdisplay.asp?plant_id=3586>. Web. 07 June 2016. 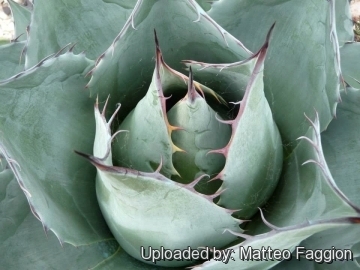 6) August J. Breitung: Agave parrasana. In: “The Agaves.” The Cactus & Succulent Journal Yearbook, pages 78–79, 1968. 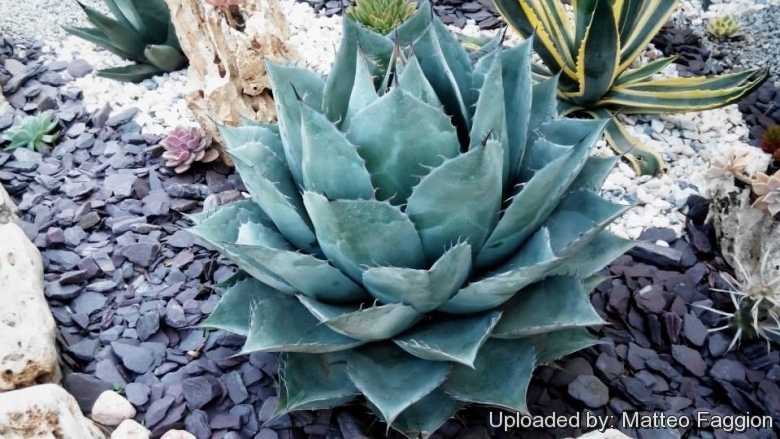 Cultivation and Propagation: Agave parrasana is a stunning specimen plant for containers or a well drained spot in the garden noted as rare in cultivation. It tend to be slow grower, taking several years to achieve a mature size, but worth the effort. Soil: Grow them in porous soil with adequate drainage. 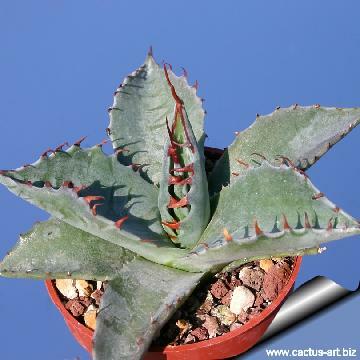 As with many other species of Agave, this one is not too particular about the soil type as long as the roots do not sit in waterlogged soil. Exposure: They should be grown only in full sun. The leaves will keep their blue-grey color and the plants will stay more compact. Water requirements: Water thoroughly when soil is dry to the touch. In winter watering this plant can be done once every 1-2 months, there is no need to mist the leaves. Older, more established plants need water less frequently than do younger, newly planted ones. Heat and drought tolerance: Excellent. 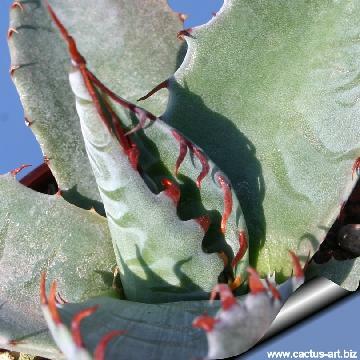 Pests and diseases: Agave parrasana seems to be particularly susceptible to indoor burn or edema, a condition where large patches of tissue die and turn brown when plants are subjected to a drastic change in growing conditions, especially from high light to low light. Maintenance: Minimal, removal of plant stalk and dead parent plant after blooming. It may be advisable to clip foliar tip spines if located in areas of human traffic. Propagation: Relatively easy to propagate by seeds or by suckers (if available) Remove the basal suckers in spring or summer and let the cuttings dry for a few days before inserting in compost. Only problem is the logistics of getting to the suckers - very sharp spines and suckers usually right up against, or underneath the mother plant. It is generally difficult to propagate asexually because it produces so few basal offshoots. 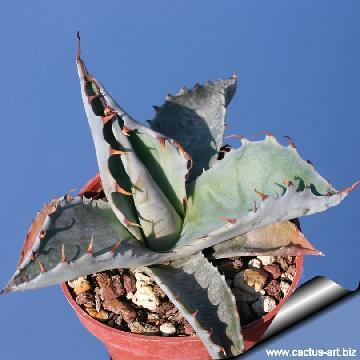 Uses: Agave parrasana make great potted plants as well as excellent landscape plants. They are wonderful when used for accent or simply to provide some all year round foliage colour and often used in a pot as a patio plant, they make an eye-catching statement and along with other evergreen plants in pots, can be moved around to change the scenery or position to give more shelter.